MICA Medical Foundation (MMF) has pledged a gift of $278,000 to support medical education at Dignity Health St. Joseph’s Hospital and Medical Center. The donation supports education highly qualified physicians-in-training enrolled in the hospital’s obstetrics and gynecology residency program. Thirty-four residents are currently enrolled in the St.Joseph’s OB/GYN program, which is jointly sponsored by Maricopa County Hospital. Residents gain valuable experience caring for patients in need of general and subspecialty services, including preventive, critical and ambulatory care, labor and delivery, surgical procedures and treatment of diseases. 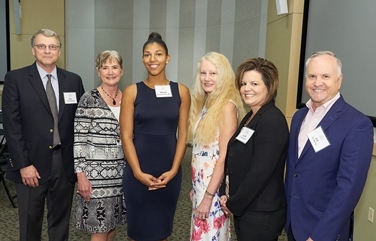 The newly created MMF gramt was awarded to Meisje Burton, MD, a recent graduate of the University of Arizona College of Medicine who is following in her father’s footsteps to pursue a career in obstetrics and gynecology. The gift marks the largest MMF donation to support a nonprofit residency program in Arizona. Founded in 2014, the grant-making organization is dedicated to enhancing medical education for healthcare professionals and supporting research aimed at improving the delivery of medical care to patients in the community. From left to right: Ron Malpiedi, MICA Medical Foundation vice presidentand chief operating officer; Patty White, president and CEO of St. Joseph’s Hospital and Medical Center; Meisje Burton, MD, the first MMF grant recipient; Amy Silverthorn, MD, MMF board chair; Julie Ritzman, MMF vice president; and Ed Marley,MMF vice president and chief financial officer. MICA Medical Foundation goes 2 for 2! The foundation makes a second gift to expand residency training at St. Joseph's. Catch a glimpse of the two hardworking recipients in a rare moment, between shifts. Click here.